Description (from front flap): What if you were casting a movie starring the Disney characters? What insider info would you want to know about them? What if you could take a peek into their files? Other files include: Men of Means and Mean Men, a cat post, a dog pound, and all the other mice. Supporting characters--including love interests, henchmen, and unforgettable group acts such as the Seven Dwarfs and the Lost Boys--are all part of the mix. 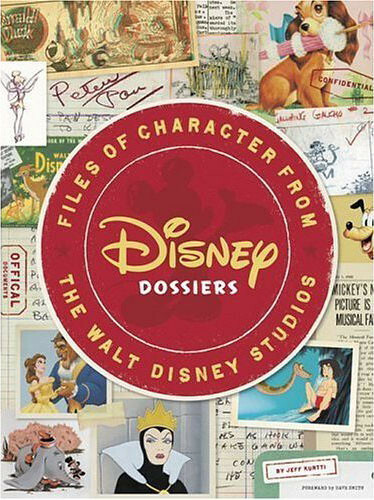 These generously illustrated character folders contain film images and head shots, comic strips, handwritten notes, and memorabilia. You'll also find vital stats, including special skills and methods of menace, honors and awards received, and comments from animators, reviewers, and even Walt Disney himself! So go on...crack open the files, and prepare to be educated, enlightened, and, most of all, entertained! GMD mention: Files for Basil, Dr. Dawson, Olivia Flaversham and Hiram Flaversham are on pages 52 and 53. Professor Ratigan's file is on page 101. Where can it be purchased: The book can be found online at Amazon.com.